Earth Day is one of my absolute favorite holidays: a day to celebrate, and recommit ourselves, to this big blue planet we call home. And as the eco-conscious, sustainably-minded folks that we are, I know that all of us are already doing boatloads of good for ol’ Mother Earth. But . . . I bet that if we’re honest, we’ll also admit that each and every one of us has some area of life where we’ve let some . . . less-than-Earth-loving . . . habits slip through the cracks. And maybe now, this Earth Day, is the time to remedy that! 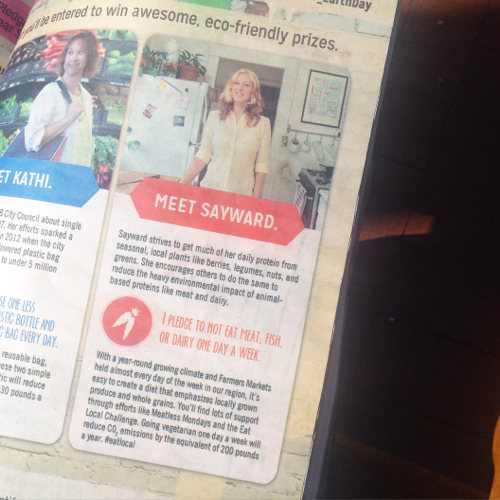 This week, I had the pleasure of being featured in our local paper’s “Earth Day spotlight”, representing for veganism and helping people to make the connection between diet and the environment. What an honor! Can you ride your bike to work one day per week? Make fewer car trips by combining errands or planning ahead to do them all on one day? If you drive 20 miles less every week for a whole year, you’ll reduce your CO2 emissions by 1020 pounds per year! *IF* you’re in the market for a new car some time in the coming year, please consider purchasing a new or used hybrid or electric vehicle! They come in all shapes and sizes (and prices) these days, with over 20 electric options and at least 40 hybrid ones. Used hybrids start at roughly $5,000, and brand new electrics lease for as little as $200 per month. Next time you wash a load of laundry, take advantage of the “Solar Dryer”, aka a clothes line. Now that the weather is warming up, its time to make this seasonal shift into delightfully crisp and fresh line-dried laundry! Drying 2 or 3 loads of laundry this way each week can add up to over 200 pounds of CO2 emissions saved each year. Replace your plastic water bottle with stainless steel or glass. Refuse to accept plastic bags when you buy from stores – bring your own bags or just carry your purchases in your purse or arms. Look for the places where plastic adds up in your grocery cart (yogurt cups? “clamshell” produce packages?) and aim to reduce that by finding alternatives, buying in bulk, or making those items from scratch at home. Going vegetarian for even one day a week will drastically reduce your carbon and water footprints, and with programs like Meatless Mondays or VB6, it’s really easier than ever. I know that a lot of my readers here on Bonzai are not vegan or veg – and I think that’s GREAT! I love that you guys are here, open-hearted. 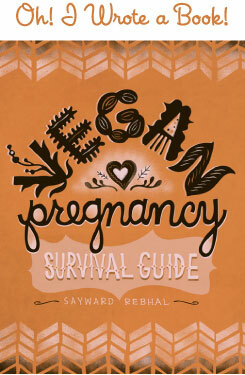 And you’re probably already mindfully reducing your meat and dairy intakes, which is great as well. So this year for Earth Day, why not commit to whittling that reduction down even further? Diet really is the one place where you can have the MOST impact in terms of personal power in effecting real change. So empower yourself, and eat more plants! And what about us? 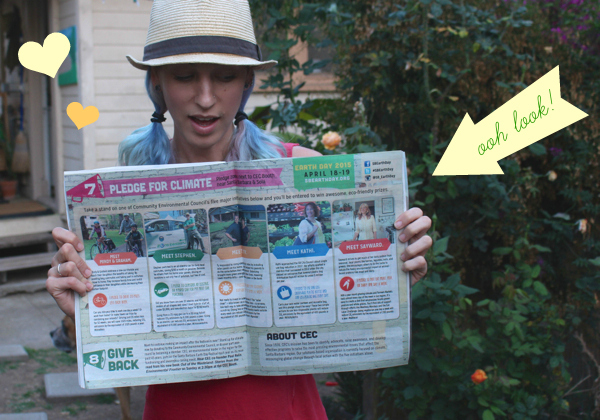 What will Waits and I be doing to Make Earth Day Matter this year? Tom’s And TerraCylce sent us this giant box, so that we and our friends could fill it with old broken toys, which we’ll then ship back to them to be turned into products like tote bags, watering cans, and more. From useless to useful! It’s pretty freakin’ amazing, man. Working together like this last year, Tom’s and TerraCycle kept 11,000 pounds of personal care packaging out of landfills, and that’s just the beginning (learn more here). Because now, you can sign up to join the Natural Care Brigade, so that YOU can send YOUR personal care packaging waste to TerraCycle to be upcycled, completely free of charge (Tom’s foots the bill). Seriously, it’s a great program – check it out! So what do you think, guys? How are you celebrating Earth Day this year? I’d love to hear from you! Don’t worry about sounding like a shill, it doesn’t! You sound like someone who’s truly passionate about what other people are doing, and that happens to be a company, so what? 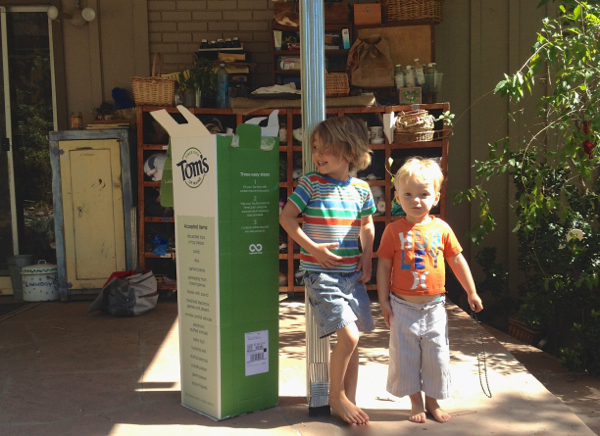 I love Tom’s and TerraCycle’s mission as well! Our toothbrushes, cereal bowls, and colander all are from upcycled plastic (and why doesn’t Disqus recognize upcycled as a word?! sheesh! ), and I love upcycled products are becoming more and more popular. In regard to sounding like ad copy – yes, sure, it did sound a bit that way, but you acknowledged it and moved on to discuss why you also actually believe in this message. That’s about all I could want in this regard (I read a lot of running and fitness blogs and many of them will repeat the same ad copy from a corporation on the same day, just as though it was their original thoughts without acknowledgment of the problem outside of a “sponsored post” disclaimer; so what I’m saying is thank you for being self-aware and open/honest – that’s all we need). In regard to Earth Day, one of my biggest sources of eco-guilt is the packaging waste generated by shopping at Trader Joes. I have come to really love the food and prices there, and their overall ethic is a great one–they just wrap everything in plastic and there’s no option for bulk or bringing your own produce bags. I struggle with this – the money I save from shopping there vs. the eco-guilt of that waste? I thought perhaps I’d write to them about doing some kind of in-store recycling program for their packaging. I’ll also check out this terracycle program, since they may take that stuff too. This is also something I want to show to my daughter’s school – they could collect a lot of stuff to send back. (So there you go – you may have “sounded like ad copy” but it’s a program many of us will want to have learned about so it’s all good – thank you!). Yay for Earth Day! I always make a few commitments to try and do better each Earth Day. Sometimes, I forget my reusable bags or my People Towel (reusable towel that hooks on my purse for bathroom hand-drying). So I’m hoping to get better about those things! Earth Day….what a great time to recommit to good practices! I am thrilled that the frozen tundra of WI is thawing out and I can get reacquainted with my bike. Fun and function! This Earth Day is stressing me out though. I’m heading to Europe for work for a couple weeks and am worrying about how to keep up my vegan efforts outside of my little zone. It will be a challenge with no kitchen and no usual resources but I’m going to try. Thanks for the inspiring post! And man I hear you on Trader Joe’s! I remember back in the 90s and early 2000s it was even worse there – you couldn’t buy ANY produce that didn’t come in a clam shell. I’ve noticed them moving to more loose stuff like apples and citrus and stuff, which I really appreciate. And I think that TOTALLY came as a result of customer feedback. So yes, please write them a letter! We all should! That stuff adds up and impacts companies more than we realize, I think. Happy Earth Day Bianca! Also I have never heard of this People Towel but I LOVE that idea and I’m going to go looking for it now – so thanks for the rec! Happy Earth Day Kristin! And good luck with your travels. My ravel staples are always apples, bananas, peanut butter, and bread. No refrigeration required, and good filling food. Then when you eat out you can just order salads and plain pasta or whatever. Peanut butter is great because it’s available everywhere, and it has protein so it will keep you full and sated!